We LOVE color themed parties! Color is a simple, yet creative way to make a party more special. We hosted a white party for our 30th birthday and followed that spectacular celebration with pink, blue and green themed birthdays. This week we wanted to tell you about our amazing time at BrunchCritic’s 3rd Signature Orange Brunch Gala in Brooklyn. This was a unique event where all the guests were dressed in ORANGE. The Gala featured a scrumptious menu from seven of New York City’s top brunch spots and an oyster bar. We even met some of the cast from Orange is the New Black! The best part of this event is that 100% of the profits were donated to the Michael J. Fox Foundation for Parkinson’s Research. Both BrunchCritic and Michael J. Fox Foundation have orange logos, so all attendees wore at least a splash of ORANGE! Guests arrived on the ORANGE Carpet to be photographed by Sunny Norton. Doesn’t the room look stunning with guests, drinks AND decor in orange? There were 8 stations featuring brunch bites from seven of the best restaurants in New York City and an oyster bar. The food was DELICIOUS and plated beautifully. Many bites were also dressed in 50 shades of orange. We tried all of the food and the Bacon and Kimchee Fried Rice was our favorite — let’s just say we went back for seconds and thirds! Guests also enjoyed specialty orange cocktails featuring EFFEN Vodka, Woodford Reserve, Herradura Tequila, Aperol, Valdo Prosecco, RIPE Bar Juice and American Juice Company. Our favorites were the Bellinis and Cosmopolitans. The bartenders even sported ORANGE suspenders and sunglasses! The brunch had a surprise guest appearance from 9 Members from the Netflix show, Orange is the New Black. Chris Norton and his band kept guests dancing all afternoon. A trip to Napa Valley was raffled with roundtrip airline tickets courtesy of Eleven Eleven Winery and JetBlue. We LOVE Photo Booths. Guests sported orange sun hats, sunglasses, leis, lips, mustaches and boas. Aquaman even made an appearance! Shake and Share Media took some great Photo Booth pics. This was our favorite picture from the evening! 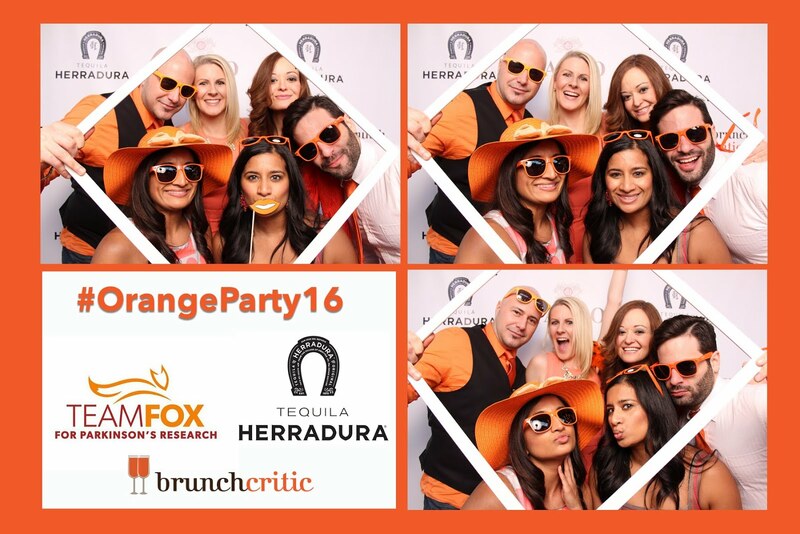 Thank you Andrea and BrunchCritic for organizing a wonderful Orange Gala. We had a blast along with the other 400+ guests that attended and supported the Michael J. Fox Foundation for Parkinson’s Reasearch. Special thanks to the sponsors that helped make this event happen! Restaurants: Allswell, Willow, Pork Slope, Runner & Stone, Aita, Hecho en Dumbo, Cassette, and Empire Oyster. Guests departed the swanky brunch with some serious swag. 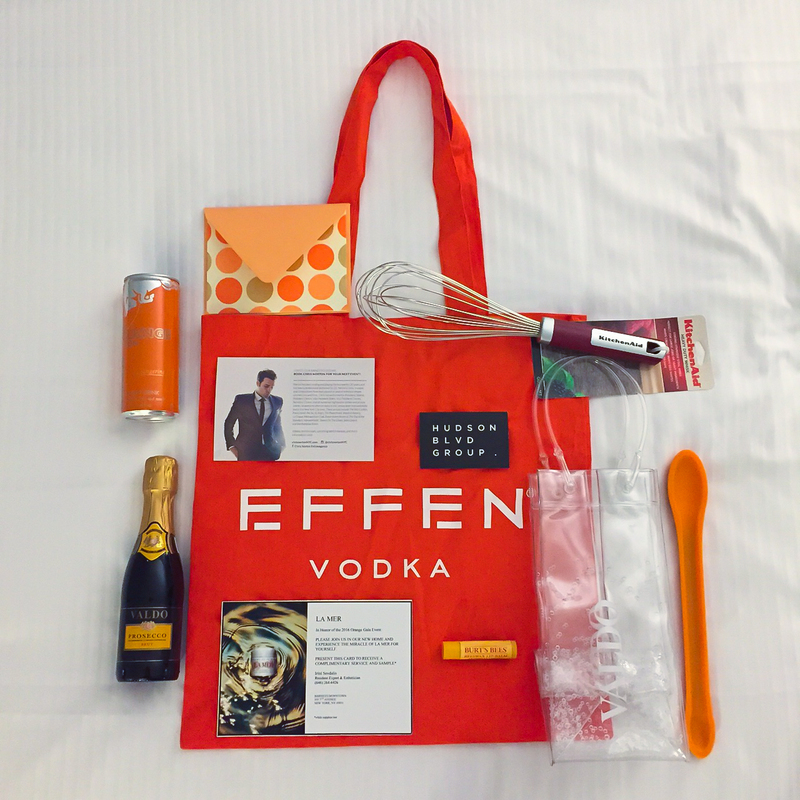 Inside the bright Orange EFFEN vodka bag were: a Kitchen Aid whisk, a Tasting Spoon, a Mini Valdo Prosecco, a Valdo Prosecco branded Chiller Bag, an Orange Red Bull, a Burt’s Bees Lip Balm, a $50 voucher to Spruce and Bond and a Complimentary Service card to La Mer at the new Barneys in Chelsea. We can’t wait to enjoy all of the goodies. Once you've taken in the unique décor at these venues, the hardest part is to decide whether to go upstairs or downstairs. With a large open floor plan, you'll find bars on both levels, and someone will always come by to serve you matter where you decide to hang out.